This Plug-in allows connecting to Tableau server and extracting various types of data for Metrics, Reports and Datasets in Metric Insights. 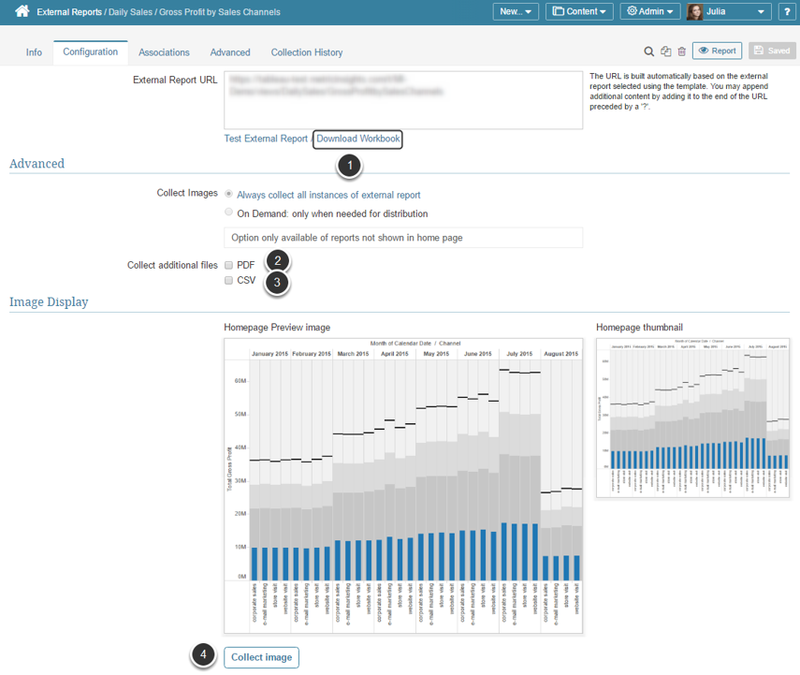 This way, you can combine Tableau and Metric Insights efforts to understand your data better. 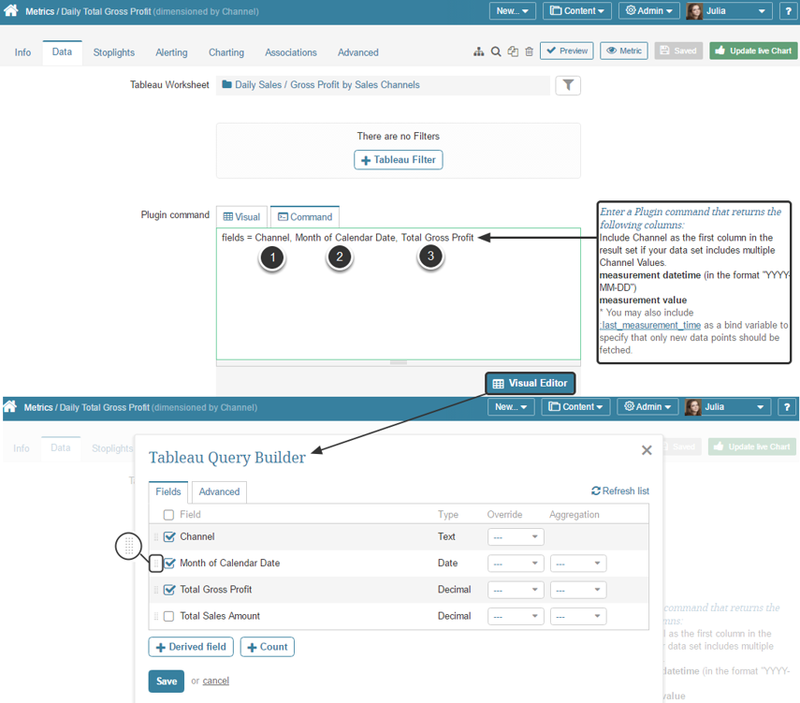 If the required Tableau plugin has been already created, select it from the list. Automatically: If the External Reports fetch method field is set to 'automatically', go to the Tableau Reports List tab and simply click Refresh list to collect all Tableau reports currently available at the server. Manually: You can also update the Tableau reports list by adding report IDs and Names one-by-one or loading them in a CSV file. The following examples are for Metrics, but the same Tableau plugin capabilities apply to building regular Reports as well. Data for Metrics and Reports is extracted via a plugin command, consisting of parameters specifying what data should be fetched. If you are familiar with Tableau syntax, you can write a command manually or use a Visual Editor available under the Plugin command field. This way, the command can be constructed simply by checking the fields that should be included into the request. Please note that this method is also favorable since it eliminates the likelihood of mistakes often made when typing the command manually. Make sure that your command lists columns in the right order. Consult the hint text to the right of the Plugin command field. To change column order in the Visual editor, click the icon next to the column name and drag it to the position it should be. NOTE: Make sure that selected fields are defined in the correct order. If this Metric is dimensioned, the dimension field should always go first. In our example Metric is dimensioned by counties, so our first field is "County" followed by Measurement Datetime and Measurement Value. You can always reference the hint box to the right of the Plugin command field to determine the required fields and their order. In prior versions, filters had to be incorporated manually into the Plugin commands. We have added a separate section that makes applying filters to the query a lot easier and more intuitive. You can apply filters manually or via the previously created Dimension Values. 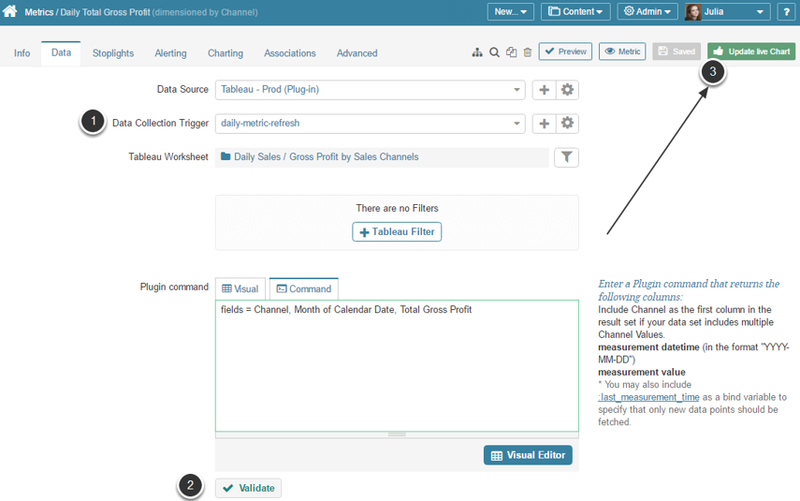 Image: External reports can be created by the means of fetching an image directly from Tableau. For direct instructions see this article. Tableau reports can be either embedded directly into the Viewer as Live Visualizations or can serve as links to a specified external web pages.